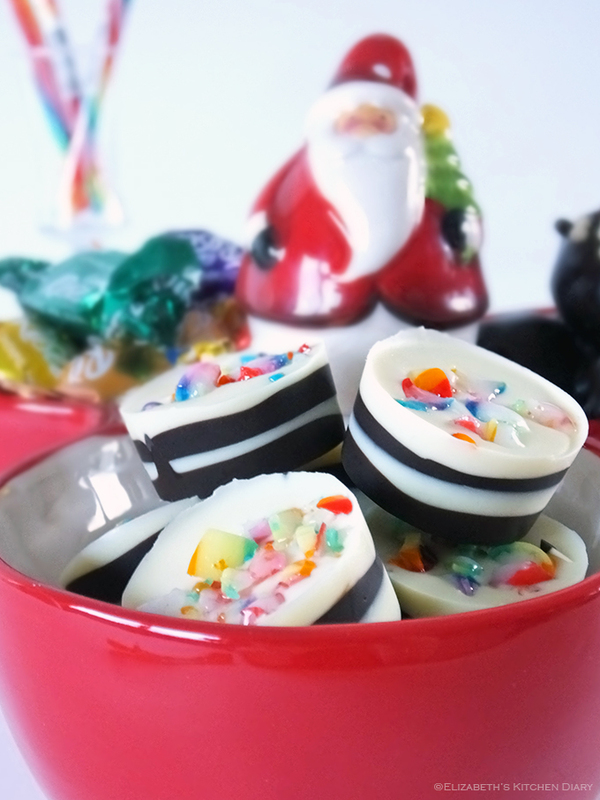 A great edible gift idea that the kids can make! When I was a little girl there was a Christmas sweetie tray on the kitchen counter at my grandmothers house. It was filled with American gum drops (you know, the big semi-hard ones covered in sugar), assorted chocolates and jelly beans. It was just there – for the whole Christmas period – ripe for the taking. It was a magical bowl, I swear, as it never emptied. I’ve got one of those magical sweetie bowls now. It’s only brought out after dinner on pudding night, mind, not just left there all week for the kids to nibble at, but still. This is one of the recipes I experimented with to fill it, and I have to say it was rather lovely! 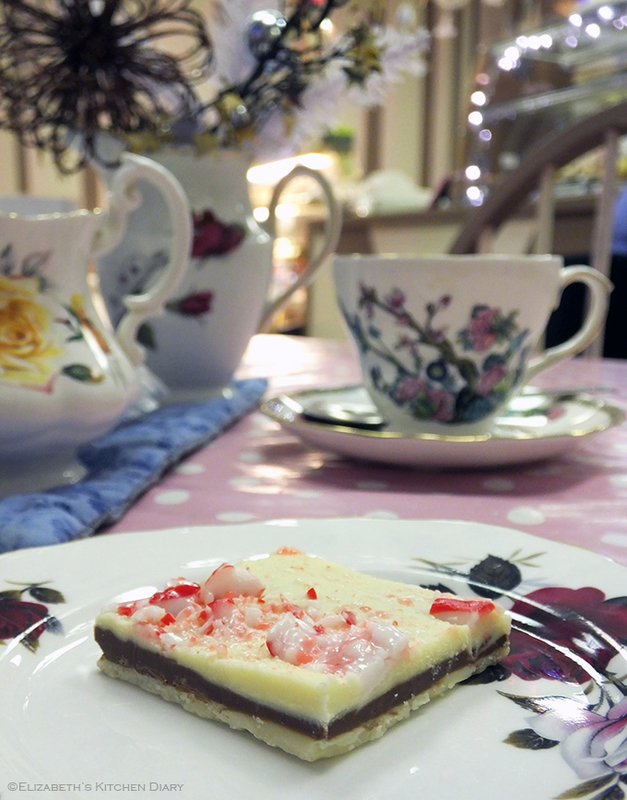 The idea was inspired by some American style chocolate bark I was given to try out at Fine Peerie Cakes last week. Fine Peerie Cakes is a super little cafe on the high street in Lerwick, and it is Shetland’s only dedicated cake shop. With lovely calming decor, classics crooning in the background, and hot coffee and tea served in the most adorable china tea cups it’s one of my favourite places to stop; a little oasis of calm among the hustle and bustle of Christmas shopping just now. They were experimenting with a new sweet and wanted me to try it! Sometimes my job is really rather awesome. Being of North American birth I was really surprised to learn that this treat hails from there. I’d never had it before. Layers of white and milk chocolate flavoured with peppermint topped with crushed candy cane – why, oh, why was this something brand new to me! So I had to recreate it at home, somewhat, so my kids could try it (that’s easier than the hour long round trip into town!). Their verdict? The chocolates were devoured within minutes. They loved them! I reckon these would make super little edible gifts too, wrapped up in a bag and tied with pretty ribbon, and they’re something easy enough to make that even the children could do it themselves. There is no cooking involved, just boiling a kettle and melting chocolate. 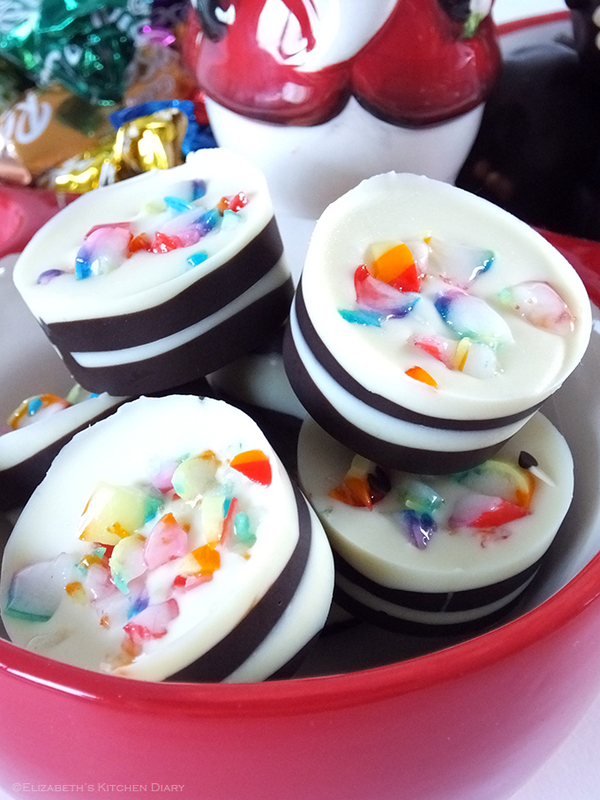 Layers of dark and white peppermint chocolate topped with crushed candy cane! Break half of the dark chocolate into small pieces into a small, heatproof bowl. When the kettle has boiled, pour the water into a small saucepan to a depth of around 1.5 inches. Pop the heatproof bowl with the chocolate in it on top and set aside to allow the chocolate to melt, stirring occasionally. Spoon just over a teaspoonful of melted dark chocolate into the bottom of a silicone mould (or use petit fours cases) swirling gently so it covers the bottom. Pop the whole tray into the freezer for a few minutes until the chocolate has hardened. Repeat melting in a clean bowl with half the white chocolate. Stir 1/4 teaspoon peppermint extract into the melted white chocolate and spoon the mixture over the top of the dark chocolate. Repeat again with the rest of the dark, and then the rest of the white chocolate. Coarsely chop or crush the candy cane with a rolling pin and sprinkle over the top of the still melted white chocolate after you've spooned on the final layer. This would make a nice gift idea - place six chocolates into a small bag and tie with coloured ribbon and a gift tag! Linking up with Festive Food Friday over at Taming Twins, Treat Petite over at The Baking Explorer (co hosted by Cakeyboi), #CookBlogShare by Supergolden Bakes, Family Foodies by Bangers & Mash (co-hosted by Eat Your Veg) and Recipe of the Week by A Mummy Too. What fun these will be – I’ll have to pencil them into my diary for November. Merry Christmas ! wow these look great! I’ve never seen or heard of these before, but I’m glad that I have now. Thanks for the recipe/post Elizabeth! These sound delicious – perfect for Christmas. I love mint & chocolate. Those are so pretty! I love the little layers. Happy Christmas! These are so pretty Elizabeth, I love the colours. The tea shop sounds lovely, you painted a fab picture of it with words, you always make me so want to visit Shetland. Thanks so sharing these little beauties on #festivefoodfriday. You made these? It looks amazing, I thought it is something that’s bought in a supermarket! these are so pretty and nice to see something a little different with candy canes! Merry Christmas! Lilinha Espindula recently posted…You Are Invited to Philips #MakeitMagic Twitter Party on Tuesday 16/12 at 7pm. Join Me and Win Exclusive Disney Frozen Prizes! A never-emptying candy jar – surely every kid’s dream! 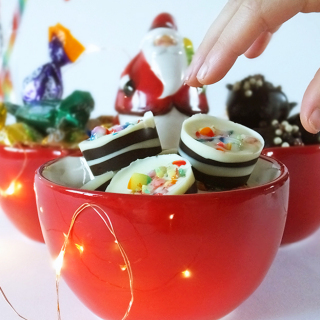 These look like so much fun, I love playing around with candy and chocolate at Christmas time. Thanks for linking to #CookBlogShare – hope we can catch up in person soon!